Marquee Las Vegas’ lineup of music programming for Electric Daisy Carnival Week 2013 kicks off tonight and goes right through until Monday June 24. The dayclub and nightclub destinations boast an eclectic array of some of the world's finest dance music DJs and producers for what will be a rammed week in the City of Sin. 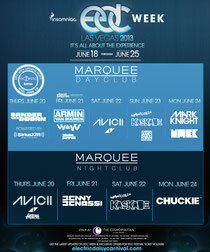 Marquee will feature Armin van Buuren, Kaskade, Avicii, Benny Benassi, Sander van Doorn, and Mark Knight, among others. Check the full line up below.